It’s been a while since the Israeli user group (iloug) had a technology meetup (SIG meeting). The last time that happened was over two years ago – and since then, we only had the bigger conferences with guests from all over the world. Yesterday we renewed that long time tradition and held such a meetup. 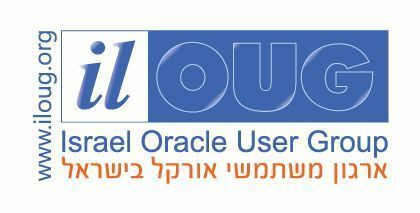 Although I am not part of the OUG board (and not for the lack of trying, just no elections for a very long time), I volunteered to help host the meeting together with Oracle Ace Associate Oren Nakdimon (@dboriented, http://db-oriented.com). I also presented a new session: “Oracle 12c New Features For Better Performance” (see below for the agenda and slide deck). This is the presentation for Rapid Cluster Computing with Apache Spark session I did in Oracle Week few weeks ago. I wrote about the Oracle Week conference in a previous post so I won’t go over that again – this was my 3rd session of that week. Although Oracle Week was for years about Oracle related products, this year they decided to open it up for other technologies as well. They had NoSQL sessions, Hadoop sessions, and even open stack sessions (including ElasticSearch and others). I was fortunate enough to be accepted to give this session which was about Apache Spark. Apache Spark is the ad-hoc solution for every new Big Data project we encounter in the last year or so. Spark is a cluster solution which uses the Map Reduce paradigm without the need for a Hadoop cluster. It is based on handling the different map-reduce function in-memory and orchestrate everything internally. If you do have a Hadoop deployment, it can interact with it very easily using its internal master or using YARN instead. This seminar is an introduction level for Oracle DBAs and other database developers. It’s main goal is to get to know this amazing technology. In the session we go over Spark Core, RDDs, how to develop for clusters and some behind the scenes for better understanding. Some of the presentation does require programming backgrounds (Java, Scala, Python) but I tried to cut it to the minimum. To my surprise, this seminar had around 35 percipient (which was way more than I expected), and got 4.91/5 in the feedback. I presented a similar session in another conference back in March but this is an updated version of that slide deck. This is the presentation for Oracle Advanced PL/SQL session I did in Oracle Week 2016, a few weeks ago. This presentation was all about PL/SQL. Most of it are things that are quite some old, but for some reason people seem to miss out on them. The presentation is divided into 3 parts. The first one is development and it takes up most of the day. We talk about complex data types, cursors and things that are into PL/SQL should probably know. In this part I also try to add some new features and stuff that people will find interesting, or else it gets really boring. The second part is about the compilation processes and the last part is about tuning. This year presentation was quite big – around 40 people in the class and got excellent feedback: 4.97/5 for overall satisfaction. This is the presentation for Oracle Advanced Querying session I did in Oracle Week few weeks ago. Since most of my readers aren’t from Israel, let explain a bit about this event. Oracle Week is by far the biggest Oracle oriented conference/event in Israel. It’s a 5 days conference that is being organized by John Bryce Education (a technology schooling company) and has around 1500 participants each year. It’s an educational event – meaning, as less promotion/sell speeches as possible. One of the main differences between this event and other conferences is the platform: instead of having five or six 45-60 minutes sessions, back to back – the event has 10-12 different day long sessions every day, for 5 days. Each session is from 9:00 until 16:30 (with breaks, of course) so there are enough time to go over many different aspects of the same topic. This session is one of the crown jewels. For years it was considered to be the largest session in the conference (with 60-80 attendees) and couple of years ago it landed in my laps. This year session was very good. The participant reviews was around 4.8/5 and course material were around 4.9/5 which was awesome. We had around 45 people in the class what smaller than last year but still the biggest session of the day. This year agenda included some of 12.2 new features (the ones I got to actually test, not all of them) which was a big improvment on last years session. 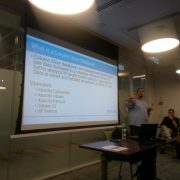 This is a presentation from outside my comfort zone – MySQL. So as most of you know, I usually do sessions about Oracle core technologies (rdbms), Big Data (Hadoop) and Spark. Even though I’ve been working with MySQL for quite some time, I never considered myself to be much of an expert – it was just always in the background. Since I decided 2016 is going to be a year of challenges in my last year resolution, I choose to take the things I learned using MySQL 5.7 and make them into a public session. I consulted some of my co-workers, and decided that the best thing will be to start with MySQL for Developers. I took everything I thought that might interest developers and off we went. I submitted this session to couple of user group conferences (and to the Oracle Open World) – but the first conference that it actually was presented at was DOAG 2016 in Germany. Since then, I presented this in two other events (the MySQL meetup in Israel and in a private event) and got some really positive feedback. What are we waiting for in MySQL 8.0?